I had the same problem with a monitor display that I have from other brand, and I solved it installing an older driver. 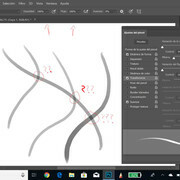 I saw people solving this kind of problems on Cintiqs disabling the option "Use Windows Ink" on the Wacom preferences, but my stylus drivers do not have this option (which would be a good idea to include on next releases). Please anyone has an idea of how can I solve it. Microsoft and Lenovo didn't solve my problem when I asked them. Thanks! Typically, how pen pressure applies in controlled solely by the drawing software so I would double-check your PS and Sketchbook settings as well.